Georgia's Official Folk-Life Play for more than 20 years! True stories, volunteer cast, a variety show and youth theater.The show is produced by the Colquitt-Miller Arts Council, using upwards of eighty volunteer actors and a professional production crew. Storytelling is at the heart of Swamp Gravy. Each year new stories are added, replacing some of the previous tales, and a new theme characterizes the season's performances. Among the annual themes have been work, religion, medicine, crime and punishment, local media, and marital and sibling relationships. Some of the stories deal with such difficult themes as racism, and spousal abuse. Originally a cotton warehouse, this 70 year old building is home to all of the productions put on by the Colquitt-Miller Arts Council. If the paintings on the outside of the building do not get your attention, just wait until you go inside. Inside Cotton Hall you will find a top-of-the-line Storytelling Museum that will captivate your attention for hours. A gift shop offers Swamp Gravy souvenirs and a concession stand that makes the best popcorn in the Southland! You will see Colquitt's own Cotton Hall quilters working on their most recent quilt, which is raffled off each year. Your enjoyment will continue once you walk through the theater doors. 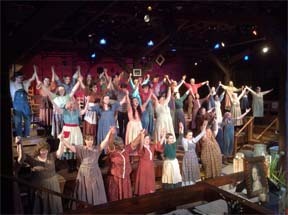 Our 284 seat theater is made up of over three stages and offers a unique theater-in-the-round experience with local volunteer cast members. It is definitely a one-of-a-kind experience. Crooked Oak Golf Club offers the challenge of an Arthur Davis-designed course with the serenity, unobtrusive service and scenic beauty of a luxury golf resort. From the well-appointed clubhouse to the groomed greens, you'll find all the hallmarks of a larger, more publicized golf club - and none of the inconveniences. The clubhouse is designed in the style of an old-fashioned Southern cottage and features breezy porches, intimate seating downstairs and a large meeting room upstairs. The pro shop is located in the clubhouse. Crooked Oak Golf Club's 177-acre exquisitely-landscaped course features numerous waterways, which include a split-level lake and spillway. A pavilion on the lake is available for parties and other functions. 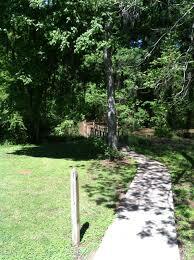 Crooked Oak Golf Club offers modest green and cart fees. Special golf packages are available, including lodging at nearby Tarrer Inn. Birdwatchers and nature lovers can enjoy a mile of trail and boardwalk meandering through cypress and wetland hard woods along beautiful Spring Creek. Tucked away in beautiful southwest Georgia. Emerald Lake RV Resort & Restaurant offer a great place to get away! Join them for a variety of food choices, relaxing by the pool or lake, and stay for a night, a week, or however long you want! 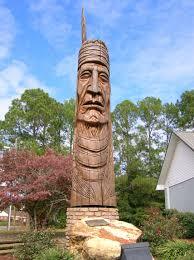 Georgia's official monument to America's indigenous people is located in Colquitt on Highway 27. The 27-foot masterpiece sculpted by "humanitarian" artist, Peter Toth, pays tribute to the spirit of the Native Americans who inhabited this land long before Europeans arrived. The sculpture is carved from a red cedar log. Hungarian born, Toth began a quest 30 + years ago to pay tribute to Native Americans by creating giant sculptures entitled "Whispering Giants" in each of the 50 states. He has completed almost 70 of the huge works of art. Toth chose Colquitt because of the spirit of hospitality, friendship, and cooperation he experienced when he visited almost 30 years ago. The Millennium Mural Project began in 1999 when the Colquitt/ Miller Arts Council received a grant from the National Endowment for the Arts (NEA). The Arts Council decided that murals, over any other artistic endeavor, would impact the community the most by drawing tourists throughout the year. 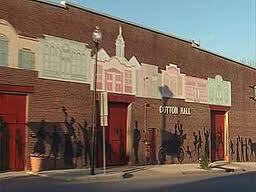 Colquitt currently has fifteen murals, with the Agricultural Icon Mural being the largest and most recent. In 2006, the State Legistlature made our designation as Georgia’s first mural City official. In 2010, Colquitt hosted the Global Mural, Arts and Cultural Tourism Association Conference. 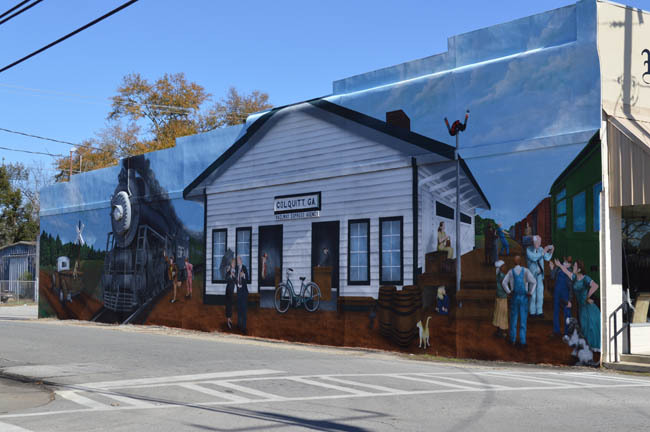 Colquitt is located in the Southwest corner of GA, equidistant from Dothan, AL, Tallahassee, FL, and Albany, GA.
For a mural tour of your own, call us at 229-758-5450. The agricultural icon mural was painted by one artist, Charlie Johnston. Charlie was chosen after a call of artist went our internationally and was picked to relocate to Colquitt, Georgia from British Columbia, Canada while the project was underway. He personally cleaned the silo, treated it, and painted it with a standard paint roller. As far as we can determine at this time, one of the largest hand painted murals in the U.S.A. has been dedicated right here in Colquitt, Georgia. The 27,000 square foot structure is owned by Birdsong Peanut Company and is used to store peanuts.On Friday, October 29, 2010, the First Mural City of the State of Georgia dedicated the Agricultural Icon Mural located just off of Main Street, and on Second Street. The dedication ceremony came toward the end of the three day Global Mural Conference held in Colquitt. The dedication event was held directly behind Cotton Hall. Jennifer P. Trawick, Executive Director of the Colquitt/Miller Arts Council opened the program and said, "I would like to welcome you here today on behalf of the Colquitt/ Miller Arts Council to the dedication and celebration of the Icon to Agriculture Mural. It has been my pleasure and the residents of Colquitt to host the 2010 Global Mural Conference this week. We have thoroughly enjoyed our guests." She told of how all of our murals tell a story, and how this mural tells the story of the American farmer being tied to the land, not to earn a living but as a way of life. With the sun beating down on his back, the farmer’s face reveals his struggles year after year. The deep crease in his forehead are the years that it didn’t rain. The lines around his eyes tell of the year that he had to mortgage another piece of land just to survive. The wrinkles around his mouth tells of his sadness as he watched his neighbor lose his farm to hard economic times. If you look closely, you can see the light in the farmer’s eyes. When he sees his crops, it reminded him of all of the good that he has sown. The family that he has raised and the friends who showed up when his crops needed picking because bad weather was on its way. It is no accident that on this mural, the farmer is growing peanuts. When the boll weevil wiped out the cotton crops across the South, Dr. George Washington Carver showed us the profitability of the peanut, and so, it became the staple crop of South Georgia farms. As our farmer pulls up his peanuts to inspect his future, his weathered hands hold the wisdom of years working the land. He can tell by his touch if his crops are dry, if they need to be sprayed, if it is time to harvest or if they should wait another three days. But his hands also hold something less tangible. They hold the knowledge that he did not and could not have done this alone. Yes, there is the satisfaction that he broke the ground and sowed the seeds, but being a part of something bigger satisfies his very soul. As the elements of nature take over and the crops began to sprout, the farmer knows that he is God’s chosen caretaker and the farm is a way of life, his way of life. Before the farmer, man roamed the earth feeding himself by hunting game, but when he began planting crops he forever tied himself to the land and created a place called home, and we call that home, Colquitt, Ga. The mural is painted on working peanut storage silos. They are owned and operated by the Southeast Division of Birdsong Peanut Company, who graciously lit the mural at night in honor of Mr. Birdsong. Watch a video of this mural process by clicking here! Built in 1905 and restored as a labor of love in 1994, Tarrer Inn invites you to revel in downtown hospitality that is a tradition in Colquitt, Georgia. Listed on the National Register of Historic Places, and a winner of the prestigious Georgia Trust Award for Historic Preservation, Tarrer Inn is more that just a pretty place. It also serves outstanding personalized service, authentic Southern cuisine and an opportunity to experience a way of life once available only to a privileged few.The inn's twelve guest rooms feature fine period antiques, hand painted fireplace mantels and private baths. From embroidered bed linens to computer data ports, you'll find Tarrer Inn offers a rare combination of elegance and convenience to ensure your stay is truly memorable. Tarrer Inn has added five rooms at the historic Kimbrel-Bush House located on First Street. Casual elegance is the atmosphere in one of Colquitt's oldest homes. 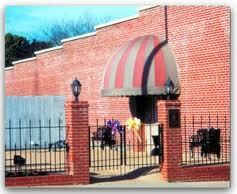 Great Southern food is what visitors expect and the restaurant exceeds expectations. Specialties like crispy Southern Fried Chicken, Glazed Pork Roast, Golden Fried Catfish and a vast array of vegetables, salads and breads always grace the sumptuous luncheon and dinner buffets. Save room for deserts made from local ingredients, like Peach Cobbler, Pecan Pie, or Banana Pudding. Top off your meal with coffee, lemonade or iced tea on the spacious veranda overlooking the town square. Adjacent to Cotton Hall, the Veterans Memorial Courtyard and Wall were made possible by a generous donation from Mr. Clifton Griffin, a World War II Veteran. Mr. Griffin lived to see his long-time dream come true and passed away two days after the wall and courtyard dedication. Over 1900 names are inscribed on this tribute to Miller County Veterans of War who served from the Revolutionary War to the Gulf War. We also have a Veteran's Memorial located on the Northwest side of our town square. Located adjacent to historic Cotton Hall. For more information, call 229-758-5450. Straight from the South Georgia woods comes the hilarious comedy trio, The Dirt Road Sports! The Sports, consists of Floyd B. Lloyd, the seasoned, debonair and experienced one, Quezelle Erskin, the opinionated and charming one, and Marvin Spitznargle, the excessive and flashy one. 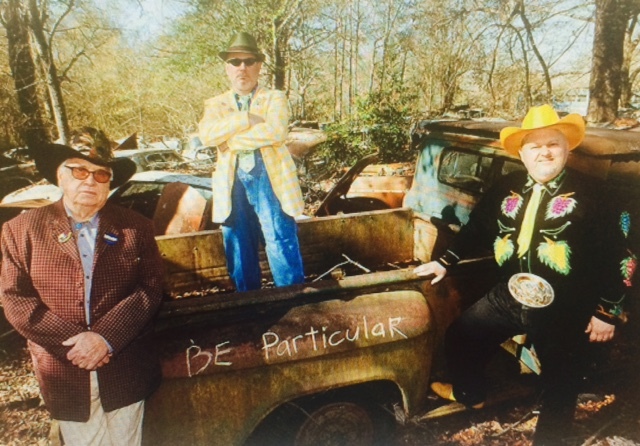 These Colquitt, Georgia storytellers have performed at family reunions, birthday parties, debutante balls, mud bog-ins, wine-tastings, tupperware parties, fundraisers, church socials, weddings, divorces and bar mitzvahs. They have been warmly received and well fed at each event. Expect to hear tall tales and true stories about Cousin Bookie, Uncle Dump, Aunt Scrap, Uncle Rudy Roy, Aunt Ro-Ho and, of course, our favorite "all-denominational" minister, Reverend Pencil Johnson. You might also hear their opinion on religion, politics and current events. For more information check out www.dirtroadsports.com or call (229)220-4925 or (229)254-5060.